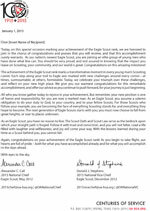 The Congratulatory Eagle Scout Letters are a resource for the Awards and Recognition chairperson meant for Scouts earning their Eagle Scout during the current year. The national chief and national vice chief and the national chairman want to recognize each Eagle on the great accomplishment of obtaining Eagle. The letters are intended for all Boy Scouts and not just Arrowmen. The requestor must provide the flag. All requests must be submitted 15 business days in advance, or the least must be 5 business days from date of receipt (if you are mailing the flag(s) please add on an additional week). Each returned flag will be accompanied by a certificate verifying the date upon which the flag was flown along with the person's name and the occasion for which the flag was flown (the certificate only has 3 lines which holds 32 characters including spaces). The specific date the flag is requested to be flown on. If no date is specified, the flag will be flown 15 business days after receipt of the flag. The point of contact’s name, address, and their telephone number (commercial and/or DSN) and email address. You can purchase a US flag that has flown over the United States Capitol building in Washington, D.C., by ordering it from your US Representative or Senator. In fact, this is the only way to purchase one of these flags. Certificate of authenticity. You may request that your flag be flown on a certain date such as a birthday or anniversary. A certificate showing it was flown over the Capitol accompanies each flag. If you mention in your letter or on your request form that this flag is for any specific occasion, that information will be included on the certificate. If you are requesting a specific date, please make your request at least 4 weeks prior to that date. Fabric and size of flags. All flags are made in the United States. The cotton flags come in two sizes: 3’x5’ or 5’x8’. The nylon flags come in the same size as the cotton and one additional size: 4’x6’. Prices. According to a survey we recently conducted, the specific prices vary from office to office. The prices include only the costs of the flag itself, the certificate, and shipping and handling. The payment must be a check or money order made payable to the fund designated by the specific Congressional office. Order information. Most web sites of Representatives and Senators have a page devoted to the process for ordering flags from their offices. Check for a link to "Constituent Services" or "Services" for the ordering information for that office. If you find that the web site does not tell how to order a flag, please call the State or field office of the member of Congress for the information. The United States Fish and Wildlife Service has recognition certificates for presentation to new Eagle Scouts, And Venturing Silver, Ranger, and Sea Scout Quartermaster Award recipients. Click here for access to the files. 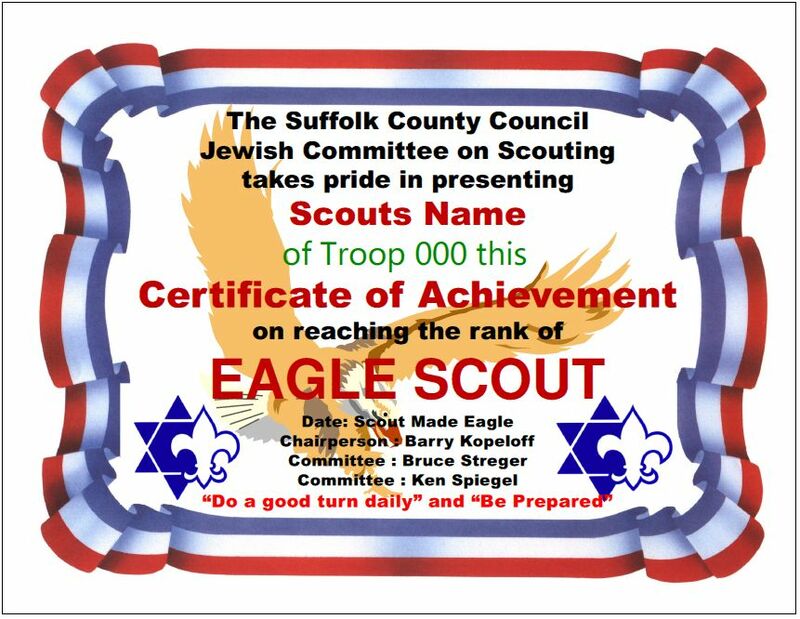 The Suffolk County Jewish Committee on Scouting has an Internet certificate that will be sent in PDF format (Adobe Acrobat) to ANY Scout/Scouter who requests it regardless of religion. 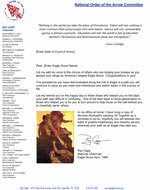 To download the required request form for the Eagle Scout Internet Certificate, Click Here. Open the downloaded form in Word or a similar word processor and enable text editing. Use only ONE Eagle Scout Per Form. Use black text 12 point Times New Roman type only. Colored text will not work on their system. Their system is semi-automated. Errors will cause your request to bounce. The program is open to all Eagle Scouts who are currently registered in an active unit and have not reached their 19th birthday during the year of application. (The application year is the calendar year, 01 Jan. to 31 Dec.) The year that Eagle was awarded is not restricted. College plans do not need to be completed in order to receive the cash scholarship. Three cash scholarship awards are given: As the National First Place winner - $8,000.00; Runner-up - $4,000.00; 2nd runner-up - $2,000.00. You may apply more than one year if you meet the age requirements but no more than $8,000.00 total may be granted to any one Eagle Scout. For a list of addresses of public officials and other individuals that may send letters of congratulations, Click Here.